Big Bang Comics #7, published in December 1996 by Image Comics, was a bit of a departure from our previous issues. Up to this point, Big Bangs had a decidedly DC Comicsy feel to them. This latest issue, however, was more in the Marvel vein. Part of the reason for our DC bent is that I was a National Periodical Publications guy during the 1960s, the Avengers being the only Marvel book that fit into my elementary school budget. Superman, Batman, Teen Titans and the Legion of Superheroes were my mainstays. They were the books I read and wanted to write some day. When DC threw out its continuity after Crisis On Infinite Earths in the mid 1980s, I went ahead and wrote those stories through Big Bang. Also, by the time we convinced a publisher to take a chance on our “retro” book, Alan Moore’s 1963 came along and was already mining the 1960 Marvel territory so we stayed out of his way for a while. However, our plan all along was to create homages and pastiches of all eras of comic book heroes and creators’ styles, and BB #7 was pretty much our first step in this direction. 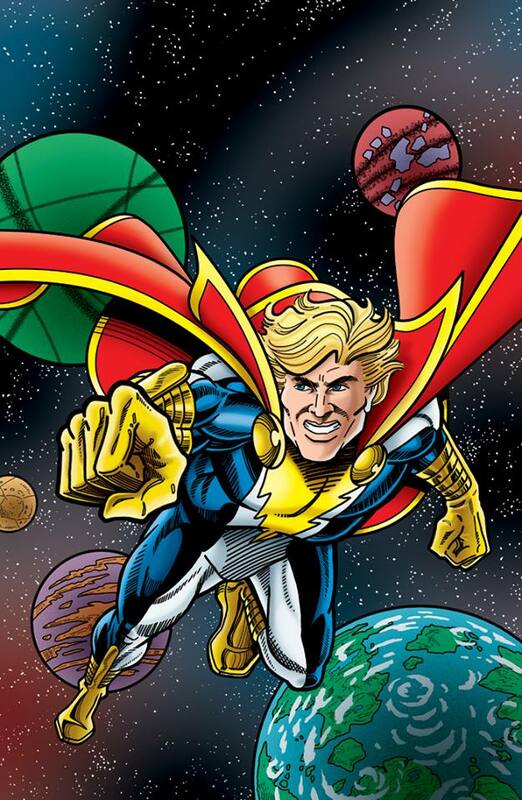 The cover and main story featured Erik Larsen’s Mighty Man. We had already done a story or two of the World’s Mightiest Man a la C.C. Beck’s Captain Marvel. The real Cap had disappeared from comic books for 20 years – DC sued Fawcett Publications for copyright infringement of Superman and they ceased publication in the 1950s – only to be brought back into print by DC in the 1970s. 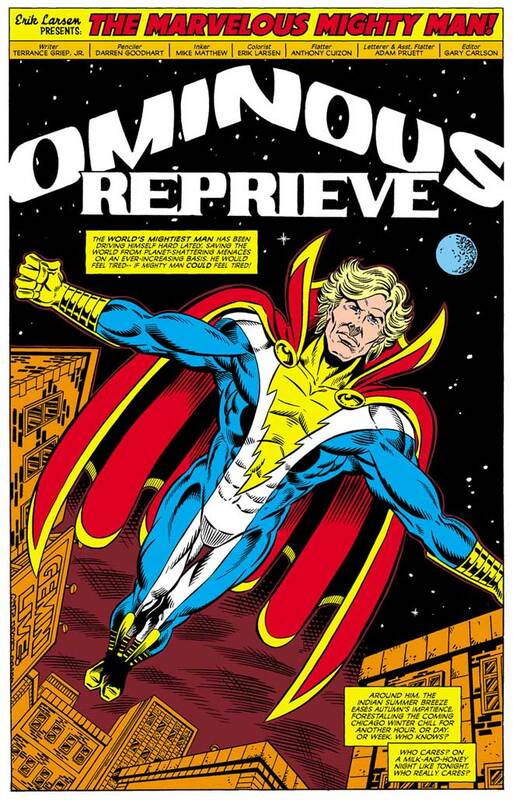 During that lapse, Marvel Comics trademarked the name Captain Marvel for a new character. DC has since marketed and recently rebranded theirs under the Shazam monicker. DC’s 1970s reboot was drawn by C.C. Beck and later Kurt Shaffenberger, the same guys who had drawn the character in the 40s and 50s. 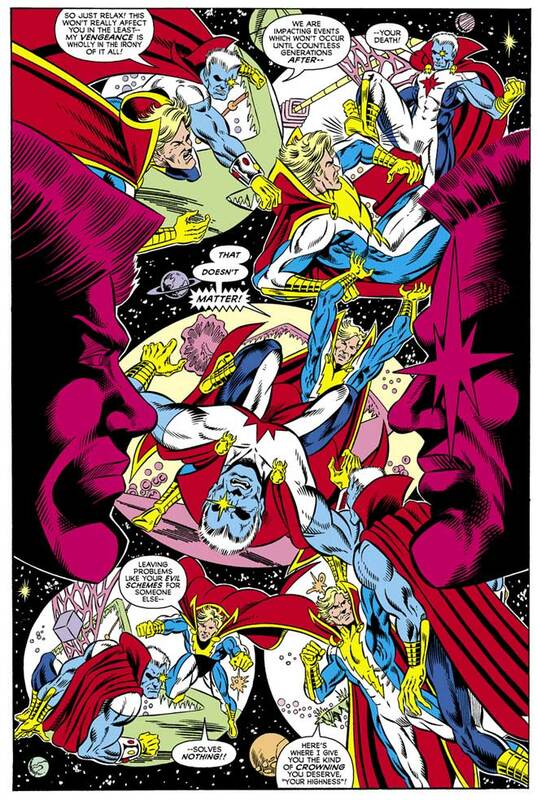 Writer/artist Jim Starlin was one of my favorite comics creators from the 1970s onward, especially his runs on Captain Marvel (and Warlock). 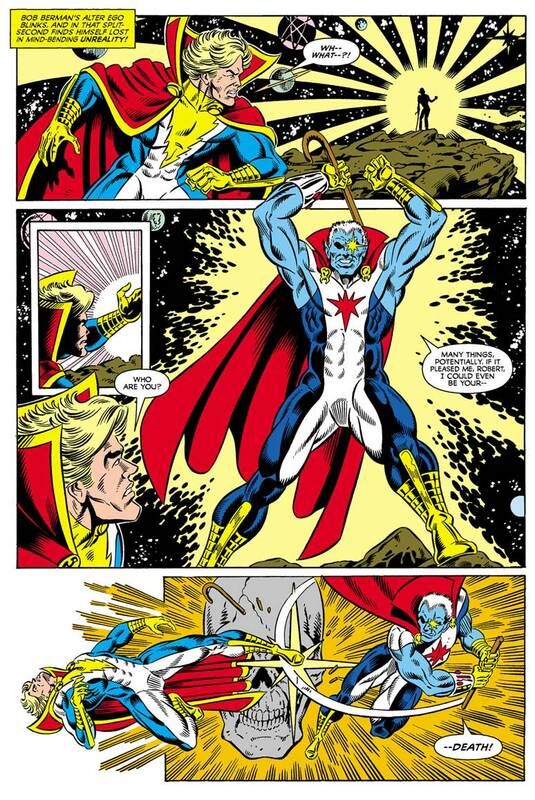 Jim’s work was full of cosmic concepts of God, Death, Suicide and Infinity, and so we based our latest version of Mighty Man on Starlin’s Captain Marvel work. The cover blurb on BB #7 declared THE MOST COSMIC BATTLE OF ALL TIME!!! MIGHTY MAN VS. MIGHTY MAN! The story itself was titled Ominous Reprieve and as written by Terrance Griep, Jr., a despot from the distant future travels back through time to steal the power from Bobby Berman in the 1970s. Most of the conflict takes place in a cosmic void called The Warp, a vacuum between seconds where both can duke it out, each as Mighty Man. The art and front cover were by one of my favorite Big Bang artists, Darren Goodhart, and his love for Starlin’s work shines bright. It’s full of skulls, and close-ups and twisting realities. The gorgeous inks were by Mike Matthew. “Ominous Reprieve” was remastered in 2015, relettered by Adam Pruett and colored by Erik Larsen himself, and printed in Savage Dragon #’s 205 and 206, along with a new pin-up/cover by Darren. The art I’ve reprinted here is from this latest version of the story. Oh. Did I mention that Big Bang #7 was printed in black & white. No color interiors. It was a cost saving move. 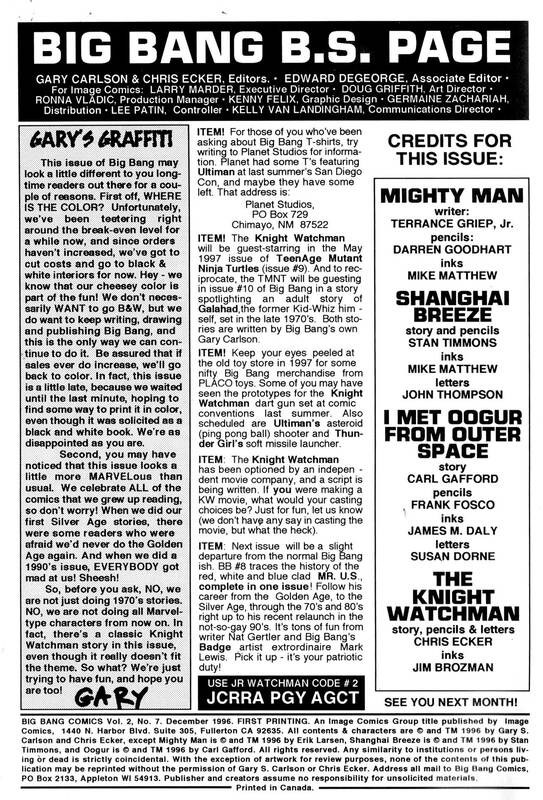 You can read all about it in my “Gary’s Graffiti” column from the inside front cover of the issue. Next up was The Assassination Run starring Shanghai Breeze, making his only Big Bang appearance. 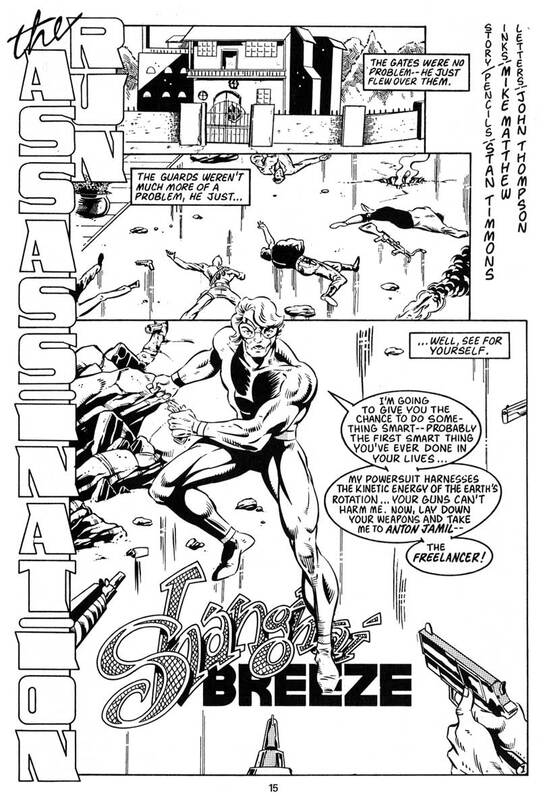 Written and penciled by Stan Timmons, with inks by Mike Matthew and letters by John Thompson, the story had the look and feel of a Marvel comic to me and this was the first issue it seemed to fit in style wise. More of an anti-hero, Shanghai Breeze, wearing a powersuit, tracked down a hijacker who had executed a plane full of victims. Shanghai killed the bad guy, snapping his neck, unaware that the hijacker’s young son was in the room. The kid shoots Breeze, vowing to track him down and kill him when he is older. 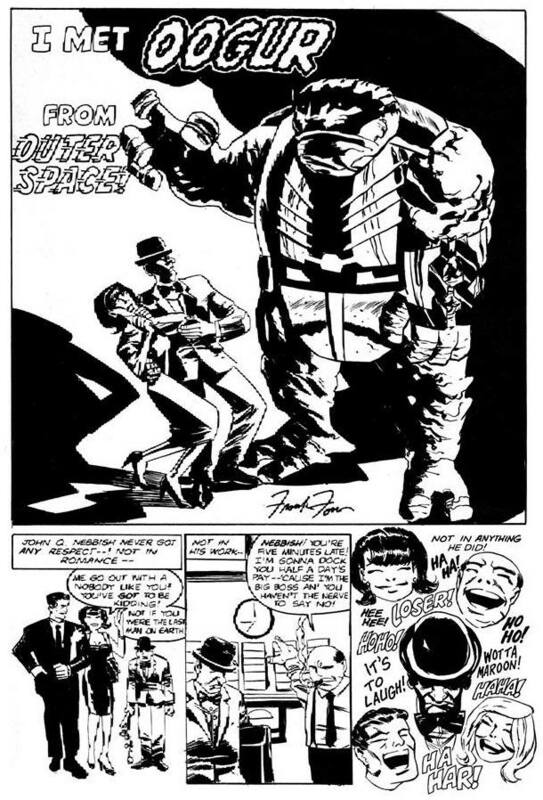 I Met Oogur From Outer Space was a tip of the hat to the late 50s/early 60s Marvel Monster stories. Written by Carl Gafford and drawn by Frank Fosco, it was a short tale about John. Q. Nebbish, a loser who never got respect from anybody during his lifetime. When a spaceship piloted by a large alien shows up, demanding a volunteer to return to his planet to be eaten by their Emperor or the Earth will be blown up, Nebbish volunteers, to everyone else’s delight. There’s a nice twist ending, where Nebbish survives as the last man from Earth. Inks were by James Daly, with letters by Susan Dorne. Finally, something familiar arrived for the longtime Big Bang fan: a classic Knight Watchman story, The Ghost Robbers Of The Wax Museum. 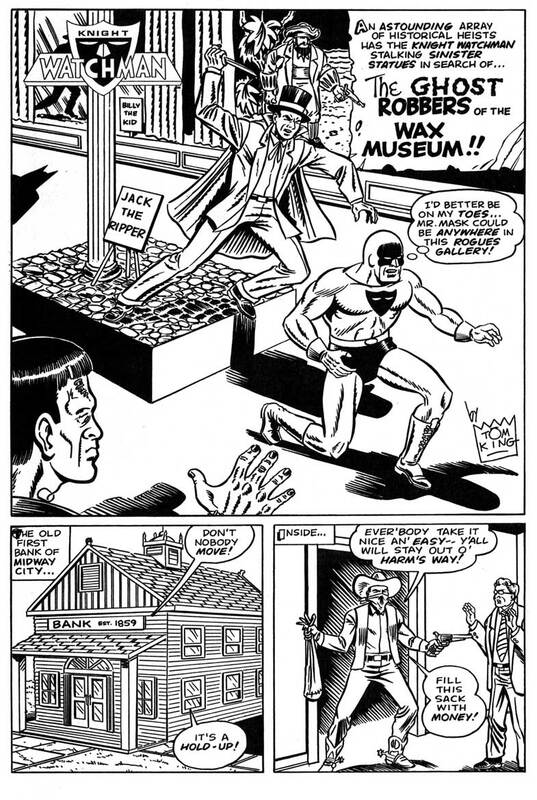 In it, a series of robberies in Midway City are apparently committed by exhibits from the Rogues Gallery of the local wax museum. Jesse James, Blackbeard, Attila the Hun and Adolph Hitler all commit crimes that lead the Knight Watchman to the museum to find the rubber-faced Mr. Mask, now dressed as Jack the Ripper, laying in wait to kill his arch-enemy. 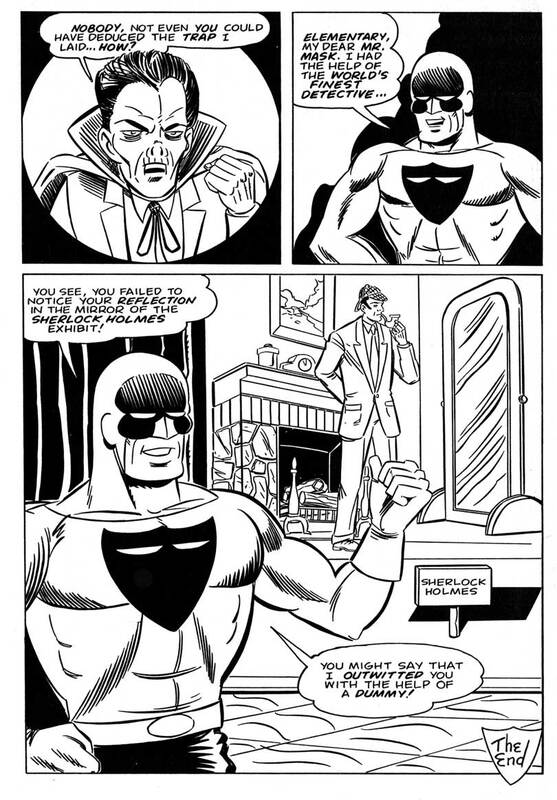 The Watchman manages to stop the villain with the aid of the “World’s Greatest Detective” – the mirror in the Sherlock Holmes exhibit. Ghost Robbers was written and drawn by Watchman creator Chris “Tom King” Ecker and inked by Jim Brozman. And that was the end of the issue, except for a back cover ad for the next issue, Mister U.S.: – 50 Forgotten Years! More info on that one next time. 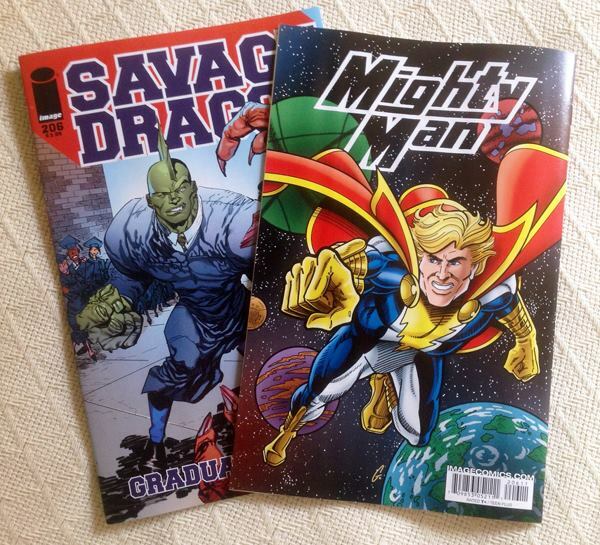 Mighty Man and all characters are © and TM Erik Larsen. Oogur is © and TM Carl Gafford. Shanghai Breeze is © and TM Stan Timmons. Big Bang Comics and Knight Watchman are © and TM Gary S. Carlson and Chris Ecker.